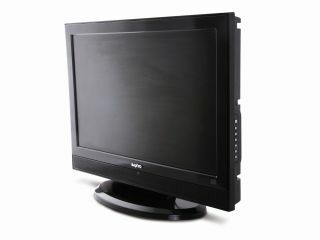 Sanyo is looking to build on the small flatscreen TV success it had with its 19in model with this: the snappily titled CE22LD94DV-B. And not only do you get a 22in LCD TV but there's also a built-in DVD player inside, making the need for a separate DVD deck in your bedroom or kitchen a thing of the past. Pixel-wise the TV is 1680x105, with a brightness level of 200cd/m2, a contrast ratio of 1000:1 and a viewing angle of 170 (h) / 160 (v). The DVD player itself supports DVD, DVD+R / RW, CD, CD-R/RW discs and it can play both PAL and NTSC discs. Nice. The new 22in model fits nicely into Sanyo's LCD range, which now stretches from 19in all the way up 52in, with the larger models supporting Full HD capability. There's no news on pricing and availability yet, but we will update you as soon as we get word.